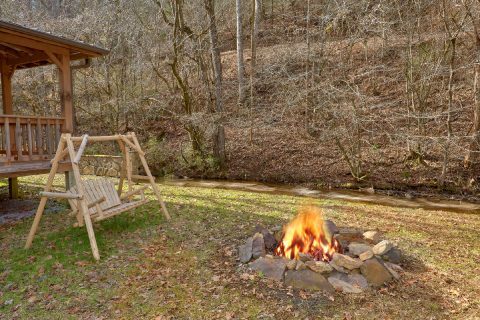 Searching for an affordable Pigeon Forge cabin with a creekside location and a fire pit? Look no further than "A Creekside Retreat," a lovely 2 bedroom cabin that sleeps up to 8 guests in comfort. 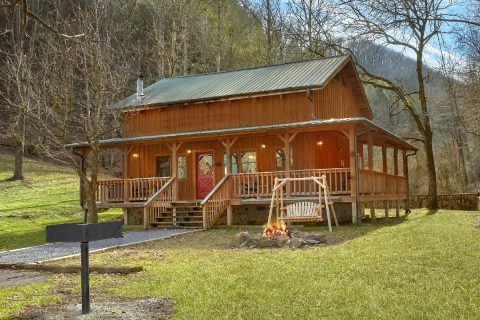 From this cabin's scenic spot along Caney Creek Road, guests of this cabin are only a 2 mile drive from the action-packed Pigeon Forge Parkway at traffic light #10. 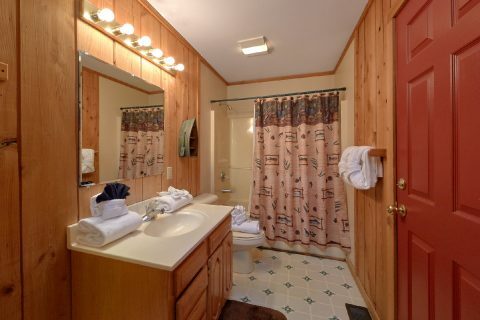 As a result, guests are only minutes from top local attractions like The Dixie Stampede, Dollywood, and The Island. 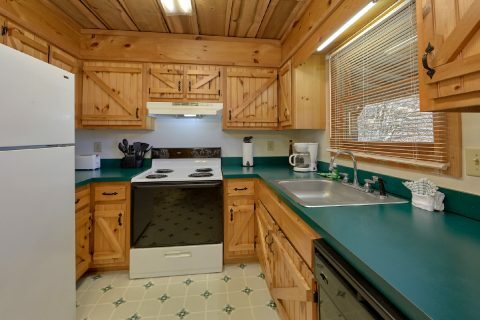 Additionally, this cabin is located only 7 miles from Downtown Gatlinburg via the scenic Spur Road. 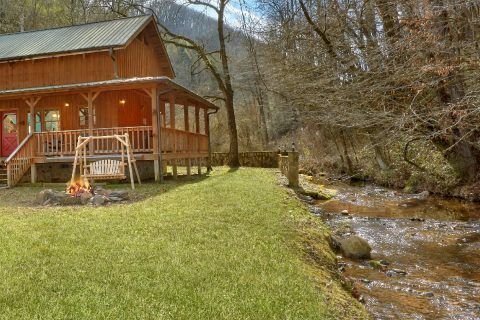 When you aren't out exploring hiking trails in the Great Smoky Mountains National Park or seeing dinner shows in Pigeon Forge, you'll love unwinding at your creekside retreat that's only minutes away. 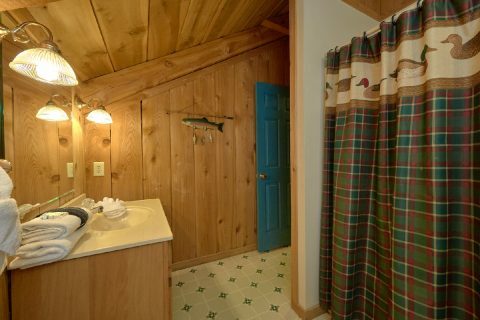 Back at your rental, you'll find everything you need to relax at your cozy cabin on a creek. 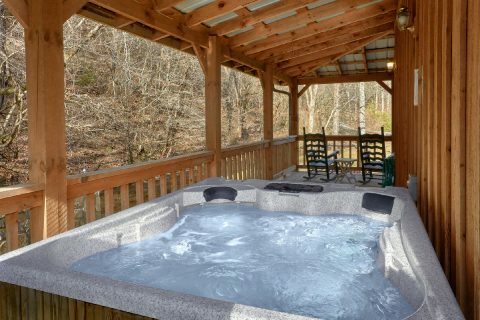 To take in the lovely scenery that surrounds your cabin, you can take a relaxing soak in the hot tub on the deck or simply sit back in one of the rocking chairs. 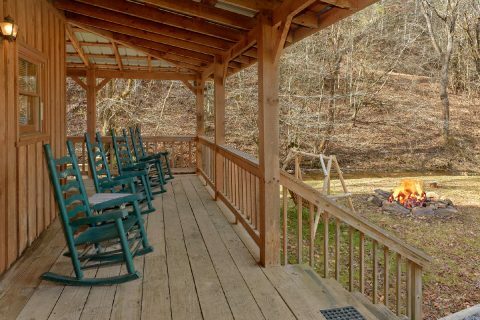 In the spacious yard, you can enjoy a cookout with your cabin's charcoal grill & picnic table and in the evening you can sit around your the fire pit underneath a starry Smoky Mountain night's sky. 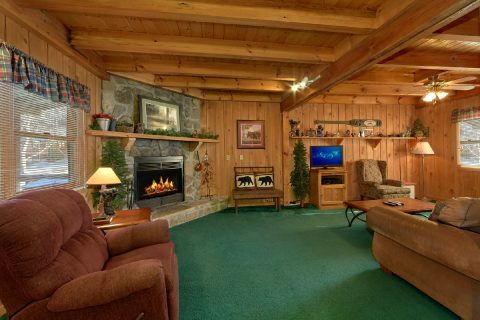 Inside your cozy mountain cabin, you can relax in your cabin's living room that comes complete with a flat-screen television and a cozy gas fireplace. 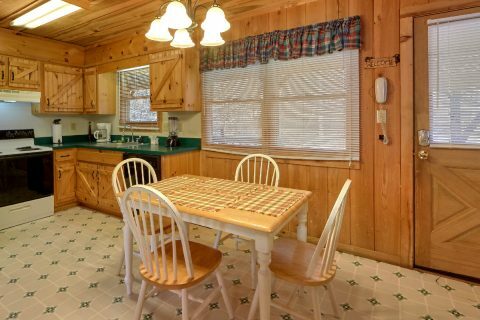 Nearby, you'll find a full kitchen and dining area, so you can make delicious dinners during your stay. 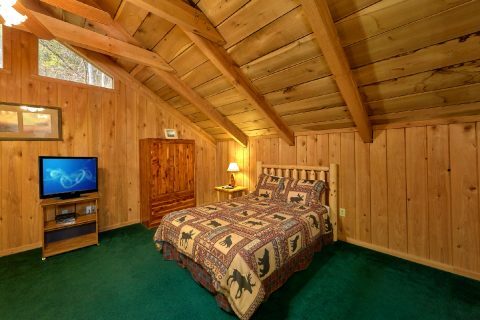 Also on the main level, you'll find a queen bedroom complete with a television and a DVD player. 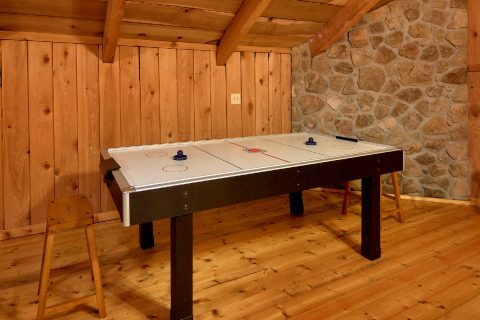 Upstairs, you'll find an open-concept room complete with a game area with an air hockey table, pool table, bar stools, and a futon. 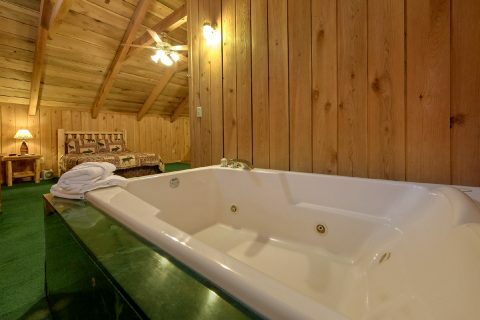 There's also a queen bed in the loft area complete with a television and in-room jacuzzi. 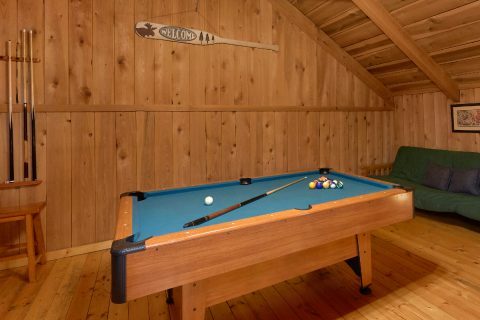 With a sleeper sofa in the living room and a futon in the loft for additional sleeping space, this cabin sleeps up to 8 guests in comfort. 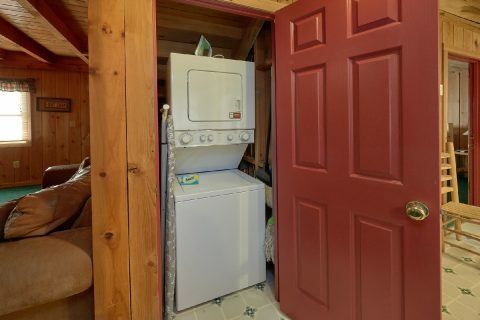 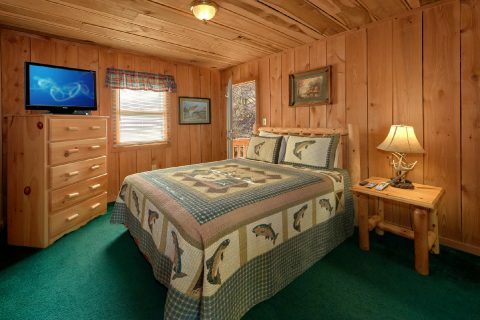 Additionally, this cabin comes complete with practical features like WiFi Internet and a washer & dryer for you to use during your stay. 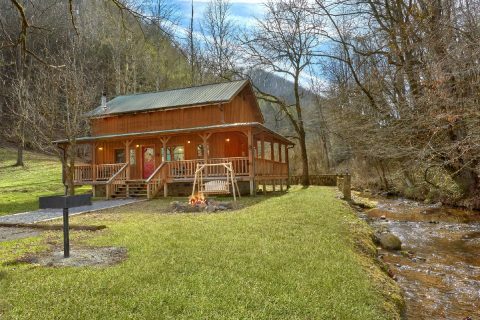 Ready to book your own Pigeon Forge cabin on a creek? 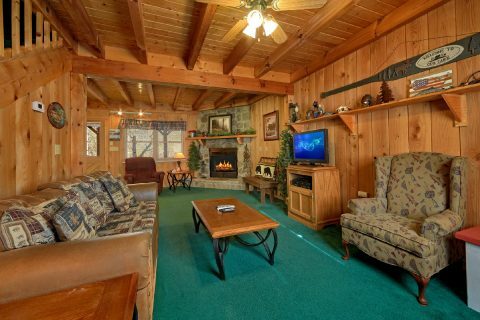 Simply check this cabin's availability on our website or call our helpful reservations office today! 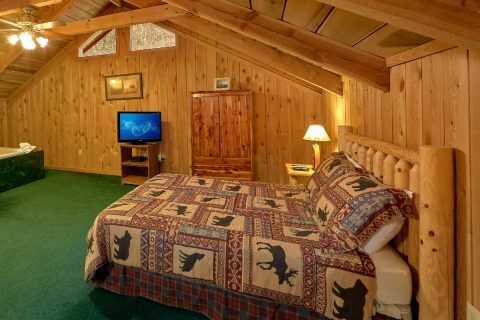 Best of all, you can save 15% on this cabin's nightly rate with our discount special!